Separated from their party, Luis Núñez Arista (Al Espinosa, left) and Jonathan Handle (Julian Remulla) encounter a stranded Phyllis Cooke (Sara Bruner. right) and her daughter Helen (Maddy Flemming). photo by Jenny Graham. The building of the Transcontinental Railroad constituted a major political and engineering undertaking that would have profound consequences on the development of the United States. Playwright Indris Goodwin has created a multifaceted drama built around an advance party in the mid-1850s that was commissioned to chart maps, detail environmental factors, identify risks from the elements and from Native Americans. The Way the Mountain Moved is situated in Utah, a crossroads of the west and the state in which the eastbound and westbound building of track would meet in 1869. Leland Stanford would drive the golden spike of completion at Promontory Summit, Utah Territory in 1869. 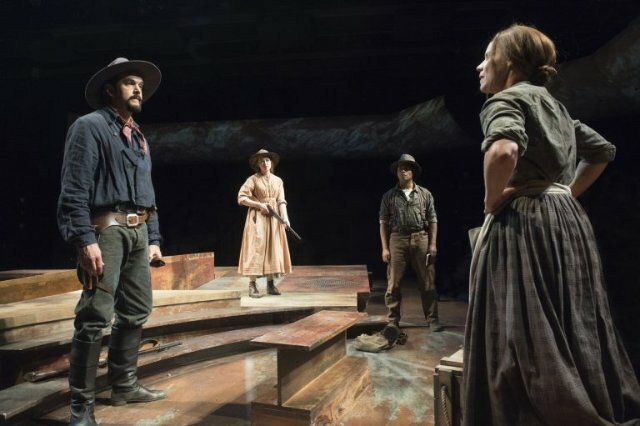 Utah possessed considerable diversity during the period, and one of the playwright’s objectives was to reveal the cultural variety and counter the stereotypes so often associated with the Old West. In particular, he dismisses the lore associated with the glory of the individualistic, white, male adventurer and the marginalization of virtually any other group. He also questions the righteousness of American expansion across the continent that resulted in wars, land grabs, and subjugation of whole peoples . Goodwin’s aspiration is to be appreciated, and he succeeds in creating a number of non-traditional western characterizations, most of which are believable, many of which are empathetic, and some of which are well developed with distinctive back stories. Included are a mother and daughter who were the only survivors of a night attack from unknowns; a black couple freed from slavery but not from suspicion; a working team of a botanist and a mute illustrator; a Mexican who stayed in territory seized from Mexico by the United States, while his family went south to remain Mexican; and a marauding couple – man and his niece. Structurally, a series of vignettes introduces the various affinity groups, with increasing intersections occurring in later scenes. As is, the narrative becomes burdened with an abundance of situations, some feeling far fetched. Without giving too much away, here are some examples. One man shoots another who he worked closely with in cold blood and in front of witnesses. The shooter’s beef was hardly enough to jeopardize being hanged for murder. A man is a thief and murderer, but when he finds a victim-to-be is a serious Mormon, he pauses to reflect and consider whether to spare him, because the killer is a devout Mormon. A man is shot and heavily bleeding, yet he and his wife go on an hours long hike to get bandages and a sharper knife to remove a bullet. A man delivers a spontaneous ode to a dying man that sounds like a meticulously crafted and rehearsed speech. As can be expected from Oregon Shakes, production values are excellent. May Adrales’s direction is effective in creating the rhythm of the action and expanding the stage. Played in the round, the stage consists of unadorned platforms, beams, and tilts of steel in desert colors. Elevated projection friezes with simple scenery surround the space. For its spare appearance, the staging does convey the sense of hazard and grandeur in the surroundings. Strong sound and lighting design enhance the production, and acting is strong overall, but there are instances when affect lacks the gravity demanded by the situation. There is much to be appreciated in the script. Along with worthy story elements, Goodwin tantalizes with a number of dangling threads. Who did attack the settlers? Is the illustrator physically or emotionally mute? Is the Native American woman saying that she will take her own life? By correcting some of the loose elements, The Way the Mountain Moved could play much better and find a deserved place in the repertory. In particular, the ramp up doesn’t create sufficient tension and interest, and the final scene between the two Native American sisters does not integrate well into the previous action. The Way the Mountain Moved by Idris Goodwin is produced by Oregon Shakespeare Festival and plays at their Thomas Theatre in Ashland, Oregon through October 28, 2018.